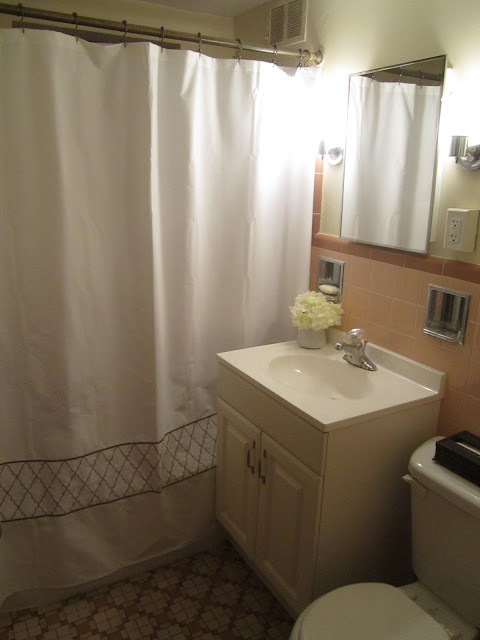 Our New Bathroom — Stevie Storck Design Co.
We are finally moved into our new apartment! The last week or so has definitely been challenging, but it is so worth it now that we finally have a place to call home again! We're not quite done unpacking, but I did start a few craft and decorating projects since I had off work today. I know, it's a little out of order but now that one room is finished, I feel better about tackling the rest!! I absolutely love the shower curtain I bought at Target. 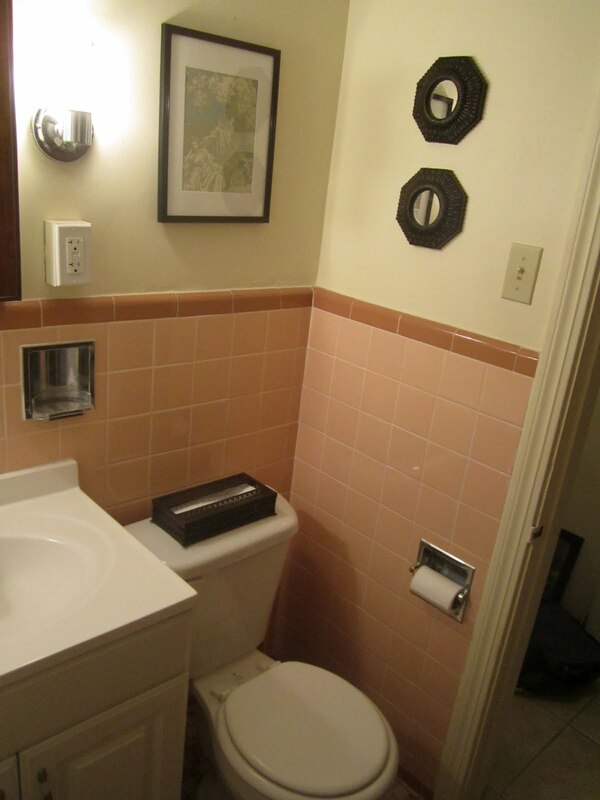 I knew I wanted to tone down the peachy pink tile that is all over our bathroom! The floor has a more golden-light brown that is picked up in the moroccan style embrodiery on the shower curtain. See? 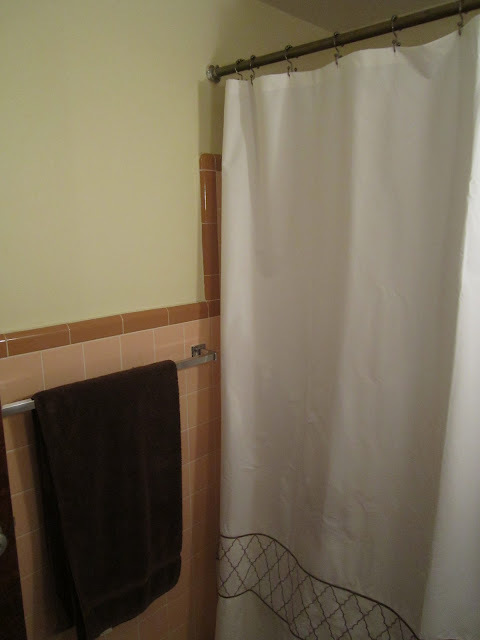 Aside from the shower curtain, all of the accessories in the bathroom so far have been DIY projects! 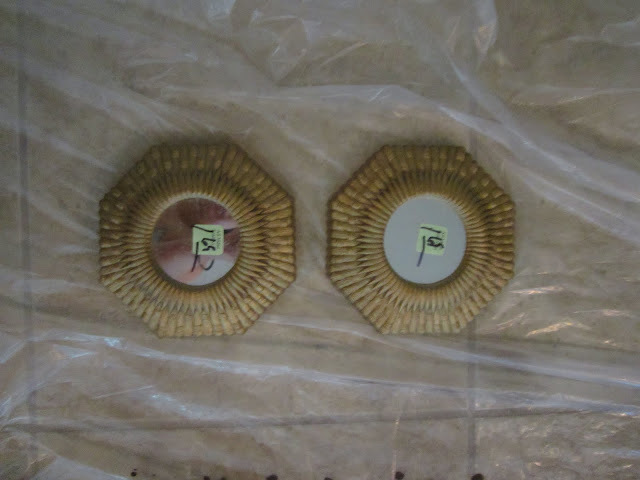 First, the octagon mirrors-- I picked these up at the Thrift store a week or so before we moved. At first I couldn't find them when we were unpacking and I was frantic! 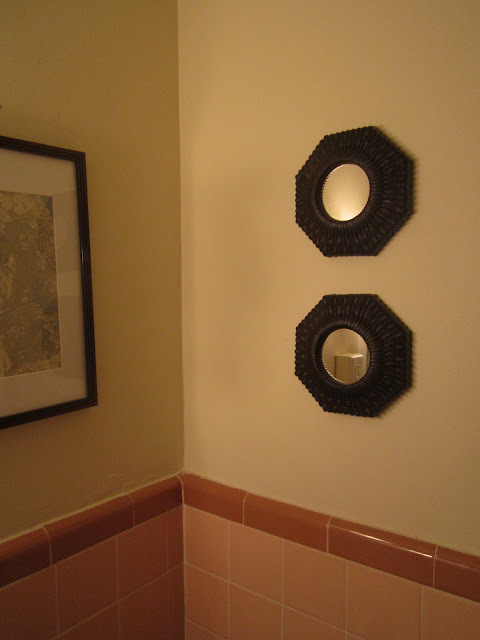 What would I do without my perfect bathroom portal-style mirrors?? Luckily they were just in a box under a few pairs of shoes, so this morning I broke out the spray paint! The original color of the mirrors was a 1980's brassy gold. Honestly, they weren't too bad, but I had a different idea for the color scheme of my bathroom. 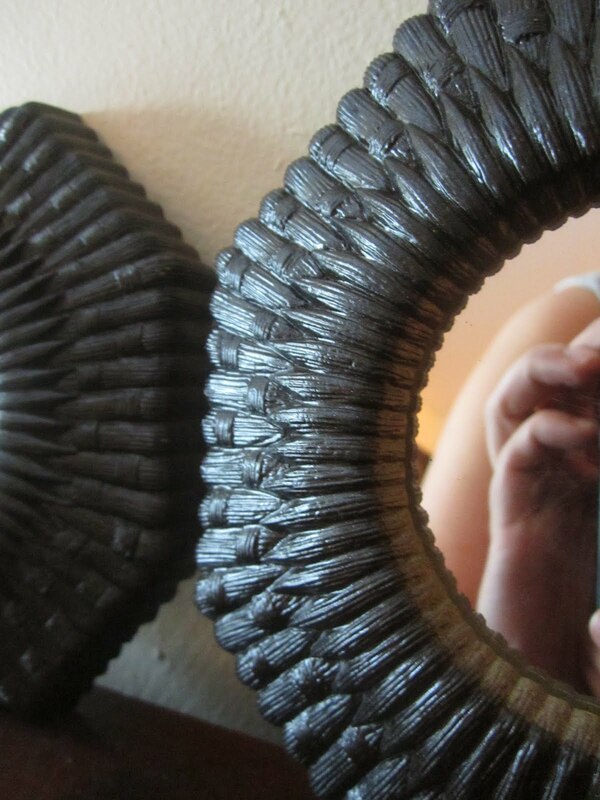 I especially loved the texture of the frames! It reminds me of basketweave, or nautical sisal rope. 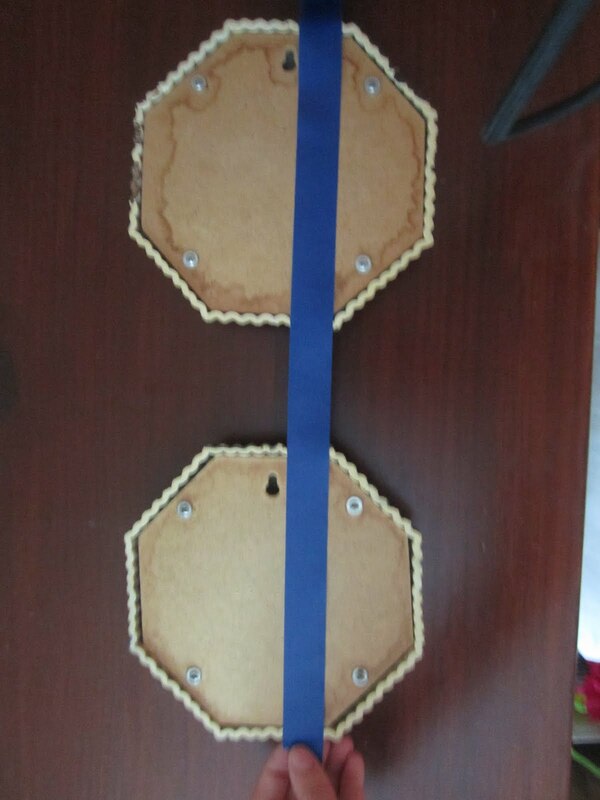 To hang them on the wall, I used a technique my mom showed me, modified so I could also set the spacing between the two mirrors. I laid the mirrors upside down on my desk, lined up and spaced apart the same way I wanted them to look on the wall. I then stretched a piece of tape from the bottom of the first mirror to the top of the other mirror, while keeping the space between the two mirrors. I then took a pen and marked an "X" next to where the holes where the nails would go were placed. I ripped off the tape and then put it up on the wall, making sure it was straight and centered in the way I wanted. Voila! Perfectly space and aligned mirrors! Another piece of wall art in the room is this framed metallic toile print. This is actually a piece of discontinued wallpaper that I gleaned from the books in the trash pile at Sherwin-Williams! The pattern may reinforce my love of all things old-lady, but I think the metallic silver outlining is funky and the sleek bronze frame and white matting make it more modern. 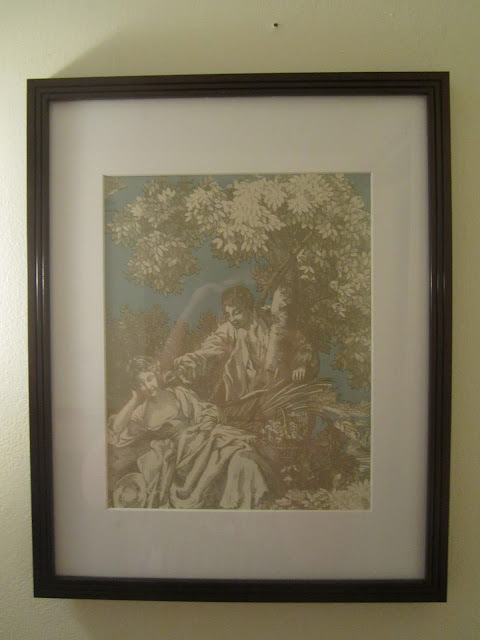 I got the frame on sale at Joann's a few months ago for something like $4, and the wallpaper for free, so as far as inexpensive wall art goes, it really can't be beat! What do you think? This vintage metal tissue box was another thrift store find. It was originally a gold color with a white wash over the raised details. I couldn't find my camera at first this morning, so I got started painting without getting a before shot, but you can imagine it right? I used the same technique as on the frames to get a bronze-brown finish. There are a few more things I'd like to get for the bathroom. I'm keeping my eye out for a cute soap dispenser, a nice bath mat and the next time we go to Ikea, we are getting spice racks to store my hair and beauty products (a Pinterest project of course!). The spice rack storage unit will be going on this wall. 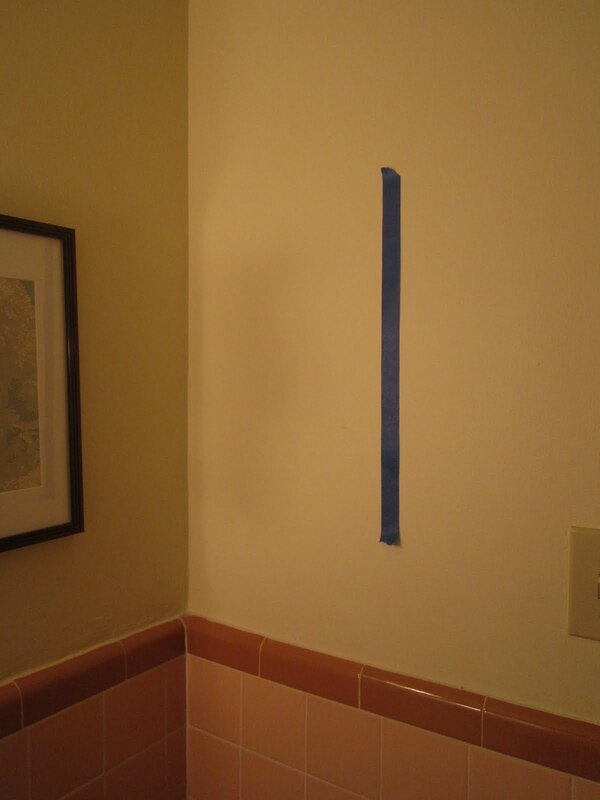 So that's the new bathroom! I'll be sure to post more pictures once I have the finishing touches complete. What do you think?